The Second Judicial District Commission on Judicial Performance on a vote of 10-0 unanimously recommends that Judge Ross B. H. Buchanan BE RETAINED. 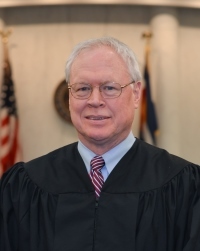 Judge Buchanan became a Denver District Judge in November, 2013. Prior to his appointment, Judge Buchanan was a shareholder with Roberts Levin Rosenberg, P.C., concentrating on personal injury (70%), employment litigation (5%), commercial litigation (5%), and insurance litigation (20%). He was previously an attorney with the Buchanan Law Firm, LLC (2008-2009), Buchanan, Jurdem & Cederberg, P.C. (1993-2008); Greene, Broillet & Wheeler (1987-1990); Buchanan, Gray Purvis & Schuetze (1985-1987 and 1990-1993); Sherman & Howard (1981-1985); and the Federal Defender Program (1980). The Commission reviewed the results of surveys of attorneys, appellate judges and non- attorneys who were familiar with Judge Buchanan’s work. The Commission also interviewed Judge Buchanan, reviewed his self-evaluation and three of his written opinions. In addition, selected members of the Commission observed Judge Buchanan in court. Of the 28 attorneys completing surveys, 89% recommended to retain, 4% not to retain, and 7% expressed no opinion. Of the 39 non-attorneys completing surveys, 90% recommended to retain, 6% not to retain, and 3% expressed no opinion. The results of the surveys of attorneys reflect that Judge Buchanan rated above the average for all district court judges standing for retention in the areas of application and knowledge of the law, communications, diligence and demeanor. However, the Commission noted that Judge Buchanan’s rating for case management was below the average combined ratings of all district judges standing for retention. Non-attorneys also gave Judge Buchanan below average scores in the area of diligence. The Commission also noted numerous negative comments from both attorneys and non-attorneys regarding case management. During his interview, Judge Buchanan acknowledged that the learning curve for becoming a judge was steeper than anticipated and indicated that he is taking proactive steps to address the concerns about case management. The Commission is confident in recommending that the voters retain Judge Buchanan.